This form of restoring the upper and/or lower arch is carried out by creating a 12/14-tooth acrylic bridge that is then fixed to 4 or 6 implants depending on the individual case, and which arch is in question. The extractions (if any are required), placement of the implants and fitting of the provisional fixed acrylic bridge is all carried out on the same day. Case Study: A patient who had had all her upper teeth present, all failing due to tooth decay. Following clinical assessment, impressions were taken for the provisional fixed acrylic bridge to be constructed. The following month the upper teeth were all extracted, the implants placed and the provisional bridge fixed to the implants, this was completed at one appointment. 12 weeks later the patient returned for a review, impressions were taken for the final restoration, metal ceramic screw retained bridge, this was then fitted the following month. The completed fee for her treatment was £16500.00. Impressions for provisional acrylic bridge. Extraction of failing teeth, implant placement and provisional fixed bridge fitting. Review and impressions for final restoration. 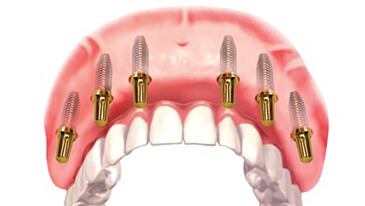 The healing period following implant placement and provisional bridge fitting is generally 10-14 weeks. If preferred patients can keep their provisional bridge for up to 6 months before having their final restoration fitted in some cases; please note the provisional bridge is temporary and not permanent. Once full arch implant rehabilitation has been completed meticulous oral hygiene is required in all cases. This includes excellent home hygiene with a good quality electric toothbrush or manual toothbrush, inter-dental brushes, dental floss, high quality mouthwash and oral irrigators. Additionally regular visits to a dental hygienist are required. (Regularity of visits will be advised by the clinician). You will also need to return for review appointments six months after treatment has been completed and then periodically as recommended by your implantologist. In some cases a patient may have poor quality or insufficient bone depth/width to successfully place implants. If this is case our implantologist is very experienced in all forms of bone regeneration, soft tissue grafting, block bone grafting and sinus lift procedures. Our fees for bone regeneration are as equally competitive as our implant fees.